The Buick Verano, which will be a luxury version of the Chevrolet Cruze, will go on sale in 2012 -- the first Buick compact car since the Somerset Regal more than 20 years ago. The Detroit News, the Detroit Free Press, and The Wall Street Journal all reported the plans this week. A GM spokeswoman declined to confirm the reports. 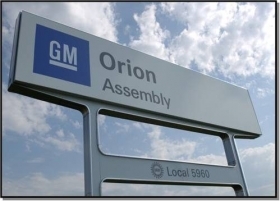 GM is set to use the Orion Township plant to create several smaller, fuel-efficient cars, including a new version of the Chevrolet Aveo for next year. GM is also set to begin production of the Chevrolet Spark minicar in 2012. The domestic production of the Aveo is a part of the recent agreement GM reached with the UAW that allows the union to negotiate separate labor agreements for plants making small cars, Automotive News first reported Monday. This amendment to the 2009 agreement was made to allow GM to profitably produce small cars in the United States. The agreement requires 60 percent of all hourly workers at the plant to receive traditional production wages of $28 an hour with full benefits, while the remaining 40 percent receive about half that wage. The addition of the Verano to the Orion Township plant's lineup is a sign of viability, GM officials told The Detroit News. GM North America President Mark Reuss, UAW leaders and several local politicians will be present for the Thursday afternoon announcement at the plant, north of Detroit. Through September, Buick has sold 114,000 light vehicles -- a 58 percent gain over the same nine months of last year.